Sarlahi—Three people have been killed and 31 other injured when a passenger bus met with an accident along the East-West Highway in Lalbandhi Municipality- 1, on Sunday morning. According to police, deceased have been identified as Srikanta Chaudhary, 50 of Sunsari, Anil Urau, 23, of same district and Babali Urau, 25, of Morang. 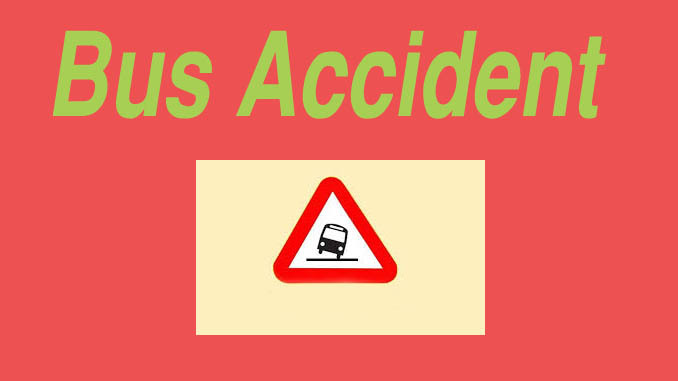 According to information, the bus overturned as the passengers were going back to their home in that reserved bus after the work in Joshi Hydropower at Sindhupalchok. Traffic police inspector Rajkumar Shahi guessed that the incident happened as the bus became uncontrolled due to driver’s mistake. Four of the injured are in serious condition and they have been taken to Biratnagar for treatment. Other injured are getting treatment in Lalbandi bases hospitals.